Farmageddon is a game published by 5th Street Games and designed by Grant Rodiek. The 30 minute card game (for 2-4 players aged 10 and up) was a Kickstarter project that raised over $25,000, five times its original goal. My wife and I got to play it at GenCon, and Rodiek was generous enough to donate a copy to her library. I didn’t know much about it, but I enjoyed it, so I wanted to do a review. The concept of the game is that players are planting, fertilizing, and harvesting crops in order to make the most money. At the same time, they are trying to interfere with their opponents crops in whatever way they can. There are two types of cards in the game – crop cards and action cards. You begin a turn by drawing two crop cards (three in a two-player game). After that, you may do actions. You can plant crops on available fields, fertilize crops (which you must do at least once during your turn if possible, even if that means fertilizing another player’s crops), harvest crops (though not on the turn they were planted), or play up to two action cards. The action cards can either make your crops more valuable, protect them from interference, steal crops or fertilizer from others, or just flat out destroy stuff on the board. A turn ends when the player draws two new action cards (one in a two-player game). Once the crop deck has run out, the game ends after everyone gets one more turn. 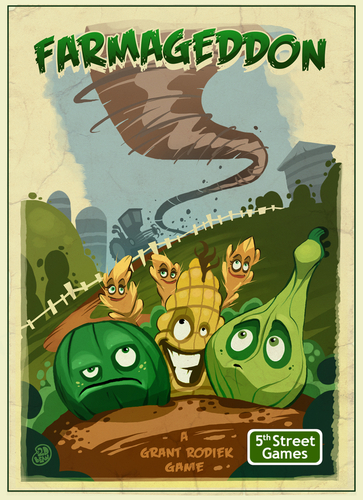 Players then add up the cash from their harvested crops to determine the winner. COMPONENTS: Farmageddon is a card game, and the cards are the only included component. They’re all fine. They shuffled very well right out of the box, which may speak to their thickness (or lack of). They weren’t as stiff as a lot of new cards I’ve handled. They also were a bit curved, a complaint that I’ve seen from a few people. Apparently, they flatten out after a few plays, so that shouldn’t be too much of an issue. Each card is very clearly marked so you know exactly what it is. The crop cards and action cards have different backs, so it’s easy to separate them. The three field cards are double-sided, so they’re easy to keep separate as well. Farmageddon does not rely on symbology, but uses text on all of the action cards. The one thing I’d like to see is some player specific tokens, particularly when using the bumper crop. It’s a card that you can play on any crop that gets you some money when it’s harvested. Using a token to mark the card will help remind everyone it’s yours. It’s a minor thing, and would have increased the price point. It might be something to do on your own. THEME: I usually don’t like farming games that much. The theme is just very blah for me. It’s one of the reasons I don’t rate Agricola as highly as a lot of people, and that I’ve shied away from playing something like Bohnanza. However, the theme works well here, mostly because of its silliness. The four basic crops are Sassy Wheat, Sluggo Corn, Grumpy Melon, and Wary Squash. There are also ten so-called FrankenCrops, extra crops that give some benefit when planted, used as fertilizer, or harvested. These include the Communal Pumpkin, Helpful Tater, Jazzy Coffee Bean, and Zombo-Weed. The action cards range from Dust Bowl to Crop Insurance, from Foul Manure to Farm Futures, from Darn Gophers to Crop Rotation. All make sense with the theme, and give you some delightfully nasty things to do to your opponents. So the theme here works for me – you probably didn’t need the farming theme, but it’s at least a lot more interesting than a lot of Euro-style farming themes. MECHANICS: The central mechanism of the game involves the planting, fertilizing, and harvesting of crops. You take one of the three available fields, plant a crop, then use other crop cards to fertilize. Using your crop cards as currency is a mechanism similar to the one used in games like Race for the Galaxy; however, here, there are only four types of crops (plus the FrankenCrops if you use them). And speaking of the FrankenCrops – I like how they allow you to do something extra without taking an action. I think I’d like to see more of those in an expansion, especially since there are only ten in the game. The whole plant/fertilize/harvest aspect of the game was very well thought out. You have to fertilize a crop before it can be harvested, and the more valuable crops need more fertilizer. You also can’t plant/fertilize/harvest all on the same turn, which makes sense – you have to wait for the crops to grow. And because you must fertilize on your turn, you are prevented from just planting something and hoarding your crop cards to fertilize it next time, or from not planting anything (because you then must fertilize someone else’s crops). That in itself might make a pretty boring game, but the action cards add much more interaction. They can be very beneficial to you (Farm Futures allows you to draw two new crop cards or take a card of your choice from an opponent’s hand) or vicious to your competitors (Dust Bowl destroys all crops currently on the board – nice if you have nothing and everyone else is about to harvest some Wary Squash). Some can also be used on offense or defense – Foul Manure can be placed on a crop, preventing anyone from harvesting, fertilizing, or taking it. It can only be destroyed by discarding cards, or by the Dust Bowl (which only destroys the Foul Manure, not the crop). So you can play it on an opponent to slow them down, or you can play it as a form of protection on yourself, then destroy it (and all other crops) with a Dust Bowl your next turn. The crop planting and harvesting gets you most of your money. The action cards make this game delightfully vicious. And, because you’re always getting more of each every turn, you’ll never be without something to do. STRATEGY LEVEL: As with a lot of card games, your strategy is primarily going to depend on the cards you draw. However, knowing when and how to use cards is huge. The overarching strategy of the game is to make as much money as possible in any way you can. So, while there’s a healthy amount of randomness, you can also form some good combos from the cards you draw to achieve your goal. ACCESSIBILITY: This is a highly accessible game – easy to understand, quick to play, and lighthearted enough to engage people in the theme. I’d say that the biggest barrier to entry in this game is the take that nature of the mechanics. If you don’t like confrontation, this may not be for you. However, my wife is not the biggest fan of conflict, and she really likes Farmageddon. It plays very quickly, and everyone can get in on the nastiness, which is more lighthearted than outright mean. The box says it’s for ages 10 and up, but I think 8 year olds would be able to understand it. REPLAYABILITY: I’ve played two games, but I’d say that there’s enough variety in the action cards particularly that this game will have a lot of replay value. I can’t see it as a game people will carve out time to play every week, but I think you’ll be able to play it over and over with a wide variety of people. SCALABILITY: The game is for 2-4 players, and I think each number provides a new experience. The head-to-head battle of the two player game means there’s only one other person you’re trying to mess with. With three, you have to keep your eye on two opponents at once, not allowing one to gain an advantage as you go after the other. With four (which is a number I haven’t played with yet), I can imagine that field space becomes a premium, especially since there are only three in the game (though there are action cards that give you an extra field). The two player game has some small tweaks, but I think the game scales remarkably well. IS IT BUZZWORTHY? Yes. This is a great game. It’s easy, fast, nasty (but playfully so), and fun. I would recommend picking a copy up – it’s only $15, and you get a great game for that price. Thanks again to Grant Rodiek for donating a copy to the Hebron public library – I can’t wait to see what else he comes up with. Thanks for reading!